One of the favorite entitlement-reforming proposals among both Republicans and Beltway centrists is raising the Social Security retirement age. It’s a bad idea. 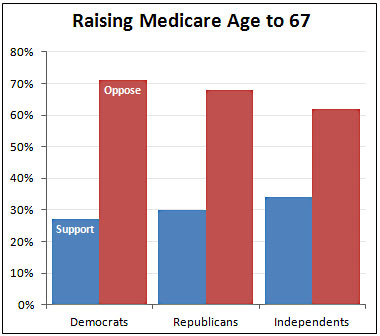 Another favorite proposal is raising the Medicare eligibility age. This is also a bad idea, though for different reasons. But it’s more than a bad idea. It’s also massively unpopular, as a recent ABC/Washington Post poll shows. It’s not just unpopular among Democrats, it’s also wildly unpopular among independents and even among Republicans. This has the potential of becoming a zombie idea every bit as bad as raising the Social Security age, and it really needs to be stopped in its tracks. It’s unfair to the poor, it wouldn’t save much money, and everyone hates the idea. It should be deep-sixed before it ever has a chance to catch on.